These canons of professional and ethical conduct are recommended as the standard for all persons who serve civil or criminal process in the State of New York regardless of whether the process served is issued from any court within the state, the federal courts, or the courts of other states. These Canons, in their entirety, shall be binding upon all members of the New York State Professional Process Servers Association. The purpose of these cannons of professional and ethical conduct is to upgrade the professional quality of the services provided by process servers and, thereby, support the orderly administration of justice and enhance the public, legal profession, and judiciary’s confidence in the integrity of the services so provided. A process server shall maintain high personal standards that do no impugn upon the reputation of the process service profession. A process server shall know and observe all standard that govern professional process service performance. It is the responsibility of a process server to obtain sufficient education and training in process serving so as to be knowledgeable of the statues and courts rules of the jurisdiction from which the process is issued, and of the jurisdiction in which the process is being served. Once having accepted or undertaken an assignment from a client or court, a process server shall strive to be prompt in the execution of the assignment consistent with the requirements of the client and of the relevant court rule or statue. When an unforeseen or unavoidable event prevents fulfillment of such obligation, the process server shall promptly report his or her inability to complete the assignment to the appropriate person. A process server shall promptly execute and deliver to the appropriate person an affidavit, proof or declaration of service, or non-service, as the case may be, in the form and content and within the time required by the court of agency before which a matter is pending and the process issued. All process servers are bound by the rules governing the practice of law and shall, accordingly, refrain from the unauthorized practice of law. A process server shall not misrepresent himself or herself as a law enforcement office, an officer of the court, or other such similar title unless that person has been so designated and appointed by a court or governmental agency, and is in the actual performance of duties related to such appointment when the representation is made. 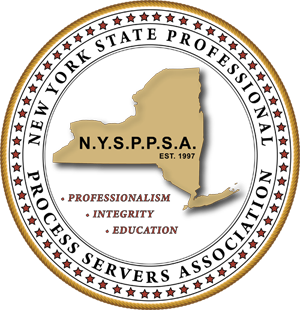 It shall be the duty of a member of the New York State Professional Process Servers Association to not engage in, nor suffer others to engage in any activity detrimental to another member or associate member of this association. Each member agrees to handle work sent to him by another member in a professional and ethical manner. No member of this Association shall employ or sub-contract to a person who has been determined to have violated these Canons, or who does not meet the requirements set forth herein. Each member shall promptly pay to another member the agreed upon for services rendered unless other specific arrangements have been made. No member shall withhold submission of a proof, affidavit or declaration of service in exchange for payment.